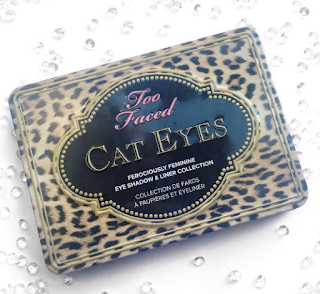 Remember the Too Faced palette I recently reviewed, here? It is no secret that I myself, am a huge Too Faced lover. I'd wanted to do a little giveaway for a while now so when @lovelibbyxx hit 1000 Instagram followers I took it as the perfect opportunity for my first Twitter giveaway! Unfortunately, there isn't much time left on this giveaway! However I can confirm a next one will be launched the week after. 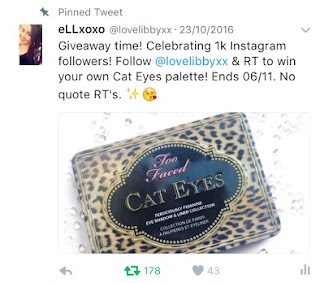 Head over to Twitter, and search for @lovelibbyxx - alternative click here! Here, you'll find my pinned tweet with the details! Just follow & retweet for your chance to win your own brand new, in box, Too Faced Cat Eyes palette! Giveaway ends November 6th 2016 @ midnight! Oh, and this giveaway is open internationally. Please note - quote retweet's do not count, to enter you must retweet the original tweet itself! Have you read: Kiss nails review | 10 things all girls can relate too | What I'm burning in October! 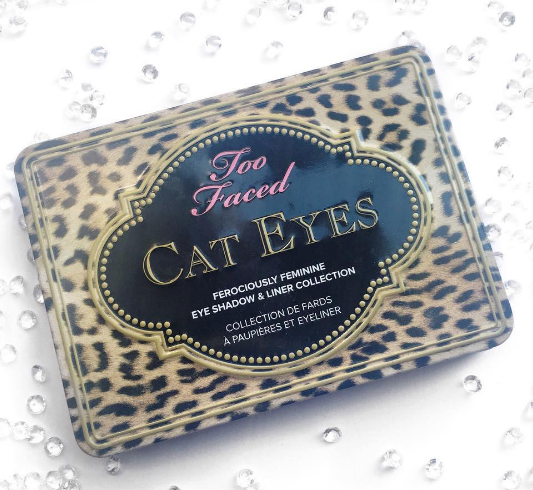 I love Too-faced!! I'm totally getting in on this 😆😎. Any other fave products of theirs? Congratulations on reaching so many Instagram followers! 5 Things Blogging has Taught Me! Makeup mistakes my teenage self is guilty of! 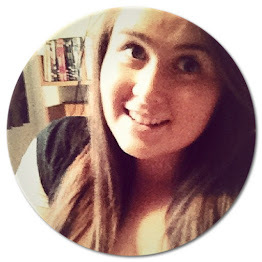 The Blogger Tag | Questions and Answers!